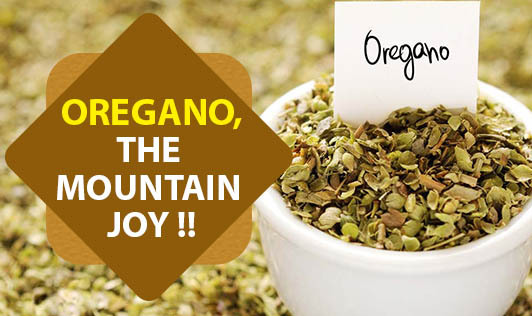 Oregano, The Mountain Joy !! The name oregano is derived from the Greek words "oros" (mountain) and "ganos" (joy) since not only was it a symbol of happiness, but it made the hillside on which it grew look beautiful. It is available throughout the year. While many people think of pizza when they think of oregano, this wonderful herb can add a warm, aromatic flavour to many different dishes, especially those of the Mediterranean cuisine. Hippocrates, the father of medicine, used oregano as an antiseptic as well as a cure for stomach and respiratory ailment. Oregano is high in antioxidant activity, due to a high content of phenolic acids and flavonoids. It also has antimicrobial activity against food-borne pathogens. In alternate medicine, it is also used for relieving headaches, cough, sore throat, fungal infections, indigestion, and painful menstruation. Oil of oregano has been found helpful against ear infections. The herb is also used as a remedy for narcotic poisons. All these properties are useful in health and food preservation. Oregano is an excellent source of vitamin K, and a very good source of iron, calcium, manganese and dietary fibre. In addition, it is a good source of magnesium, vitamin A, vitamin C and omega 3 fatty acids. Oregano, either in its fresh or dried form, should be added towards the end of the cooking process since heat can easily cause a loss of its delicate flavour. Add oregano to salad dressings to enhance the taste. Adding a few springs of fresh oregano to a container of olive oil will infuse the oil with the essence of the herb.